You’ll soon find that getting around town is a breeze! 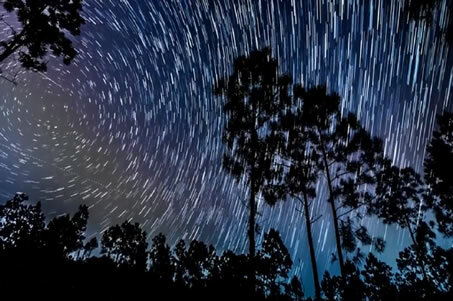 Sanibel Island measures roughly 12 miles long and 4 miles across at its widest point. 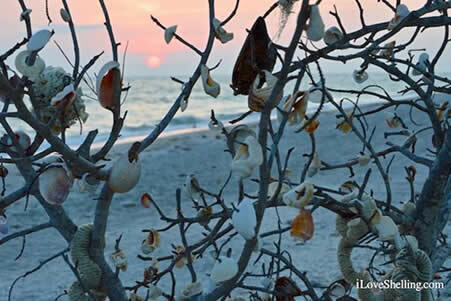 “Little Sister” Captiva Island is even more compact at just 4 miles long and ½ mile wide! GULF DRIVE, a stone’s throw from Ocean’s Reach, is segmented into East Gulf, Middle Gulf and West Gulf Drive and curves around the water’s edge. The main thoroughfare of the island, PERIWINKLE WAY, features shopping and dining establishments west of the causeway, and the Old Town area, including Lighthouse Beach, east of the causeway. SANIBEL-CAPTIVA ROAD – or “San-Cap” as locals call it – takes you to most of Sanibel’s natural attractions: The Bailey-Matthews Shell Museum, J.N. “Ding” Darling National Wildlife Refuge, Sanibel-Captiva Conservation Foundation (SCCF), and the Clinic for Rehabilitation of Wildlife (C.R.O.W.). Crossing over to Captiva Island on the bridge at Blind Pass, San-Cap becomes CAPTIVA DRIVE, which in turn, winds past the small island’s beaches, shops and restaurants. Dr. Scott Dunavant and his team at Dunavant Medical Group at 695 Tarpon Bay Road, #2 (across from the Sanibel Post Office) offer family medicine, adult medicine, wellness, sports medicine, urgent care and walk-in clinic care. 239-395-2444. Urgent care services available through Dr. Richard Wilson at the Island Medical Clinic at 1648 Periwinkle Way, Suite C2 239-472-3131 and Dr. Gary Wright at Sanibel Medical at 2499 Palm Ridge Road 239-395-2005. Pharmacies include CVS at 2331 Palm Ridge Road 239-472-1719 and Island Pharmacy at 2330 Palm Ridge Road, #12 239-472-6188. HealthPark Medical Center, a full-service hospital off Summerlin Road in Fort Myers, is less than 15 minutes from the causeway. Its emergency room stays open 24 hours a day. 239-343-5000. Bailey’s General Store a 2477 Periwinkle Way at the corner of Periwinkle Way and Tarpon Bay Road; 239-472-1516; online ordering and delivery service available. Jerry’s Foods b 1700 Periwinkle Way at the corner of Periwinkle Way and Casa Ybel Road; 239-472-9300; online ordering and delivery service available. 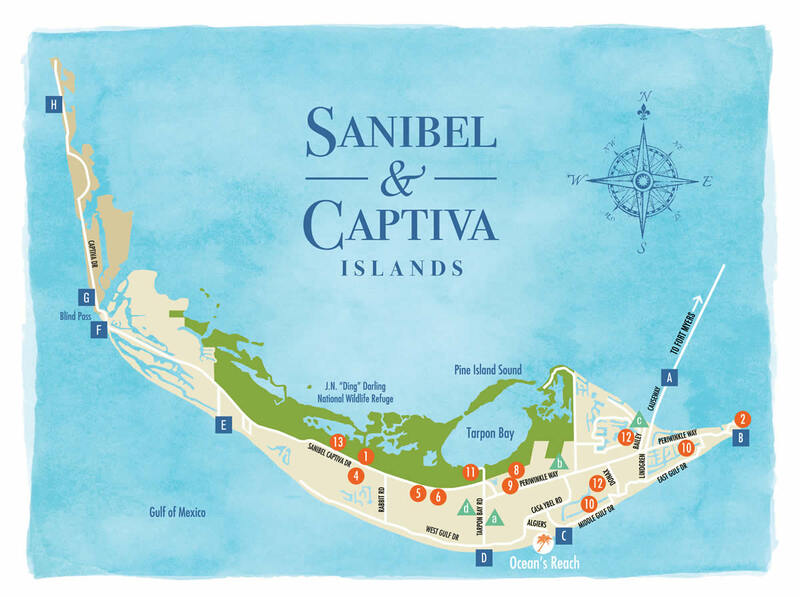 The Sanibel-Captiva Islands Chamber of Commerce c is located in a colorful island-styled building near the entrance to the islands at 1159 Causeway Road; 239-472-1080. Open 365 days a year; hours seasonal. Find information on attractions, shops, restaurants, art galleries, recreational activities and more. The main Sanibel Island Post Office d is located at 650 Tarpon Bay Road; 239-472-1573. Hours: 9:00am-5:00pm Monday-Friday; 10:00am-noon Saturday. A contract post office is located in Jerry’s Supermarket at 1700 Periwinkle Way at the intersection of Casa Ybel Road; 239-472-9300. The Captiva Post Office is at 14812 Captiva Drive; 239-472-1674. Hours: 10:00am-noon and 2:00-4:00pm Monday-Friday. Qwik Pack & Ship at 1456 Periwinkle Way (239-472-0288) and Pak-N-Ship Sanibel at 2330 Palm Ridge Road (239-395-1220) provide Federal Express and UPS service to ship mementos home. Guests may also arrange for pick-up from Ocean’s Reach by calling Federal Express (800-238-5355) and UPS (800-742-5877) directly. Our award-winning Sanibel Public Library is located at 770 Dunlop Road. Membership is offered to both residents and visitors. Internet access available, along with computer lab with printing and copying capabilities. Hours vary by season. 239-472-2483. The Captiva Memorial Library is at 11580 Chapin Lane. Membership is open to both residents (with I.D.) and visitors (with fee). Internet access available. Hours vary by season. 239-472-2133. Sanibel Community Church; 1740 Periwinkle Way; 239-472-2684. Sanibel Congregational United Church of Christ; 3559 Sanibel-Captiva Road; 239-472-2763. Saint Isabel Catholic Church; 3559 Sanibel-Captiva Road; 239-472-2763. Saint Michael & All Angels Episcopal; 2304 Periwinkle Way; 239-472-2173. Bat Yam Temple of the Island; 2050 Periwinkle Way; 239-472-0177. Christian Science Church; 2950 West Gulf Drive; 239-472-8684. 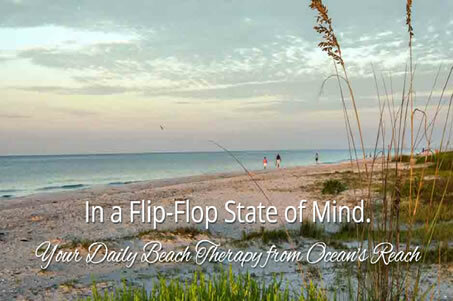 Chapel by the Sea; (seasonal) 11580 Chapin Street, Captiva; 239-472-1646.